"Next to creating a life, the finest thing a man can do is save one." For those seeking basic medical training and certification (First Aid, CPR, AED and Bleed Control), SGI has created a dynamically paced class that will enhance the student's understanding of Basic Life Saving measures. This class will also expose students to the latest trauma care equipment and techniques available to civilian First Responders. SGI presents this series of courses at our Regional Training Center in Riverside, CA. Upon completion of the Basic Trauma Care course, students will be certified in Adult and Pediatric First Aid/CPR/AED by the American Heart Association, and will possess the necessary skills and confidence to recognize, respond to, and treat a wide range of traumatic injuries. Students will also receive the coveted NAEMT Bleeding Control for the Injured (B-Con) certification. Our lead instructors are officially certified as trainers by the National Association of Emergency Medical Technicians (NAEMT), and are able to confer NAEMT certification on all students who successfully complete this course. 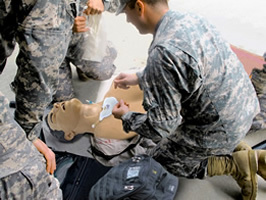 In addition to basic First Aid, CPR, AED and B-CON medical training courses, SGI offers a wide array of advanced reality-based training programs including Tactical Combat Casualty Care (TCCC), Law Enforcement First Responder TCC, Tactical Emergency Casualty Care (TECC), and K-9 Medicine utilizing technologically advanced medical training tools and human role players. 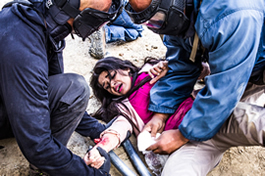 SGI has partnered with North American Rescue and KGS to make our training programs as realistic as possible using their TraumaFX line of ruggedized, untethered human and K-9 trauma training manikins, built with state-of-the-art special effects technology. 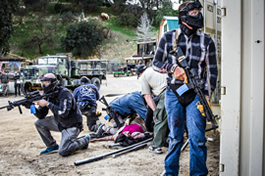 Whether you’re an Emergency First Responder, K-9 Handler, Teacher, Camp Counselor, Range Master, avid Outdoorsman, or Pet Owner, SGI offers a medical training course to meet your needs and provide you with the necessary skills and confidence to recognize, respond to, and treat a wide range of traumatic injuries.